One neat trick could go a long way towards solving the traffic problems at Wicker Park’s complicated North/Damen/Milwaukee intersection. Heck, it’s not even safe for motorists, as evidenced by the dozens of vehicle crashes each year. Banning left turns by drivers from Damen and North Avenues could address several of these issues. Eliminating the left-turn lanes would free up about about ten feet of roadway width that could be used for bike lanes in each direction, wider sidewalks, or a combination of the two. Getting rid of the right-turn lanes as well would provide even more room to play with. People crossing the street with the walk signal wouldn’t have to worry about being struck by inattentive or impatient drivers making turns. And through traffic wouldn’t be delayed by poorly-timed left turns by drivers. Traffic cameras could be installed to automatically enforce the new no-turn rule. Left turns, and their dedicated lanes, at North/Damen/Milwaukee represent a marginal perk for motorists, but a massive missed opportunity for improving conditions for walking, biking, and transit. You voice your support for this and other ideas to improve the intersection tonight to decision makers tonight at the first public meeting about reconfiguring the intersection. It takes place from 5:30 to 7:30 p.m. the A.N. Pritzker School auditorium, 2009 W. Schiller St. 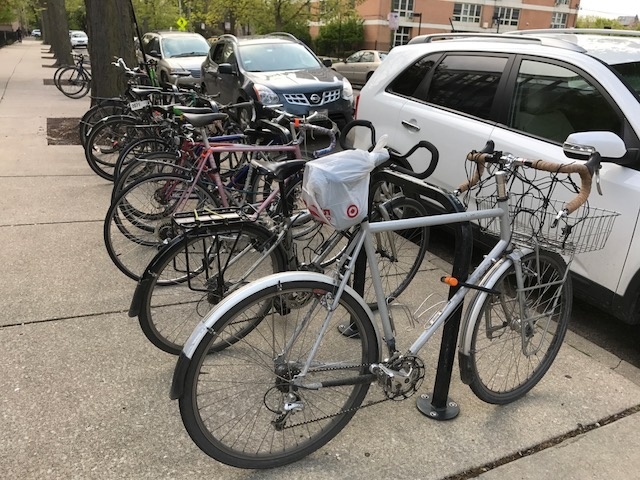 The meeting is hosted by the Chicago Department of Transportation, the Wicker Park-Bucktown Special Service Area (a business improvement district), and the offices of Joe Moreno (1st Ward), Brian Hopkins (2nd Ward), and Scott Waguespack (32nd Ward). Enforcing the rules of the road for cyclists would also go a long way. They consistently run red lights and have near misses with cars and pedestrians. Eliminating left turns at this intersection would probably reduce the number of crashes quite a bit. Smart safety improvement. I want to say they already ban left turns at Milwaukee/Irving Park. That’s a reasonable compromise for the moment. We don’t get what we need but for now I am willing to settle for less than what is needed and once more give in to the unreasonable demands of the shrill whining car congesters. Banning dirty private fossil fuel vehicles entirely and only allowing bikes and electric buses on a curbless Argyle-style pedestrianized plaza spacec is what is needed. Private cars can wait for Elon Musk to dig his underground tunnels. The city could do that, but it would be a marginal change in reducing injuries and making it a pedestrian-friendly and transit rider-friendly place. 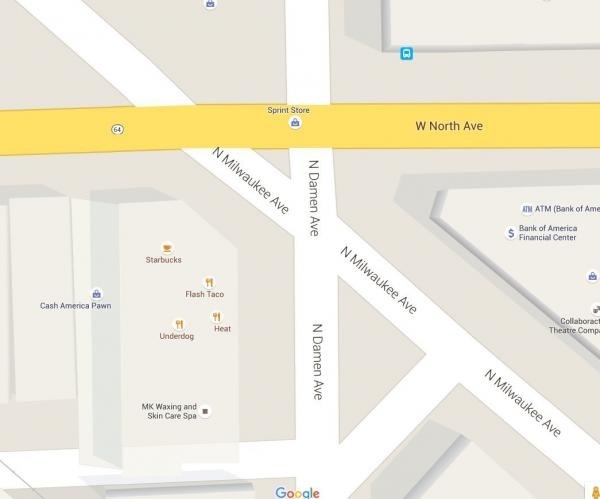 Left turns are also already banned here from Milwaukee Avenue. Yet everyday I bike home, some motorist is doing it and causing drivers and bicyclists to avoid their turn. The intersections with diagonal streets are hairy for cyclists, pedestrians, and drivers. Getting rid of left turn lanes for drivers would probably be the best move short term for the safety of everyone. I wouldn’t say every day, but drivers often make illegal left turns at the Broadway/Clark/Diversey intersection. It is too bad the city bungled the rollout of traffic cameras and won’t add more. How was turnout at the meeting? They’re removing the traffic cameras at Peterson & Pulaski. There was an informational meeting (ie, the decisions been made, we’re just meeting to inform you) at North Park Village. Write to Alderman Laurino and ask for the cameras. Why is there a slip lane and a right turn lane here? At the risk of repeating my self, here is a way to fix this mess. This is the original as seen in google maps. See my remark below. 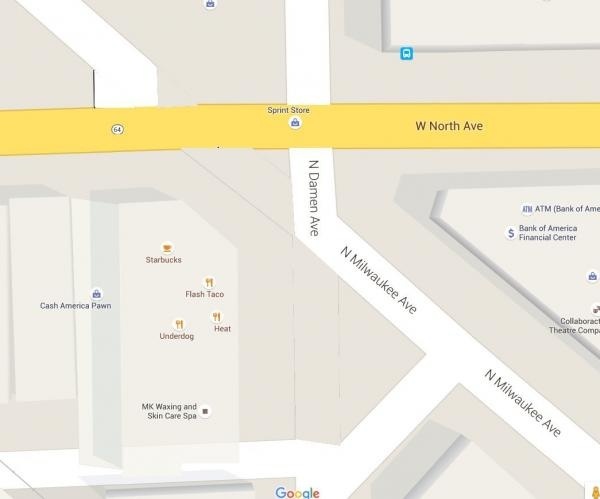 The traffic on Damen should be routed through the current island, eliminating one of the two right turn lanes. So the black vehicle should be standing where the light is and pointed northeast instead of northwest. The grey car should be next to it. The road directly in front of these cars should be a pedestrian plaza.